A fun twist on a favourite summertime dessert! 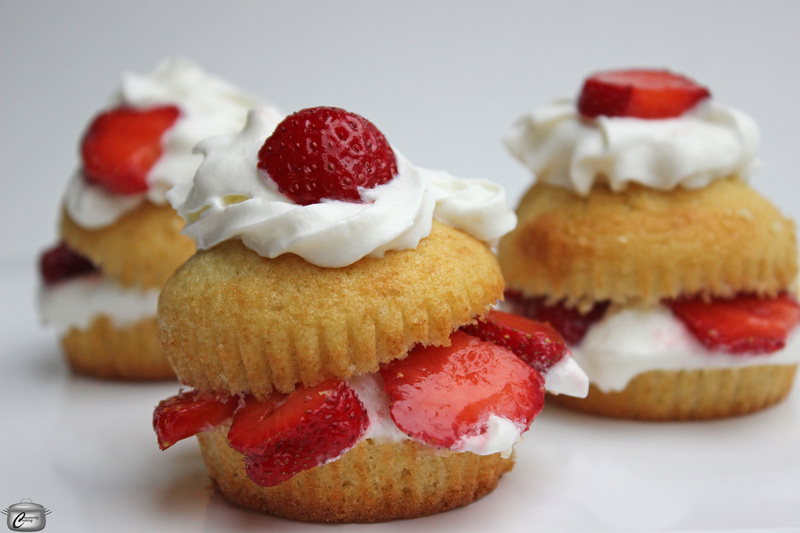 I don’t know why I never before thought of using cupcakes for strawberry shortcakes. They’re easy to make and the perfect size and shape. I took things one step farther by grilling the split cupcakes – an optional but absolutely delicious twist. I love this cupcake recipe because it makes just a small batch and they are very moist and flavourful. You can bake the cupcakes ahead of time and store tightly covered at room temperature for 2 days or in the freezer for a month, making this the perfect, easy dessert for summertime entertaining. While strawberries are a classic filling, any fresh fruit would work well in this sweet treat. 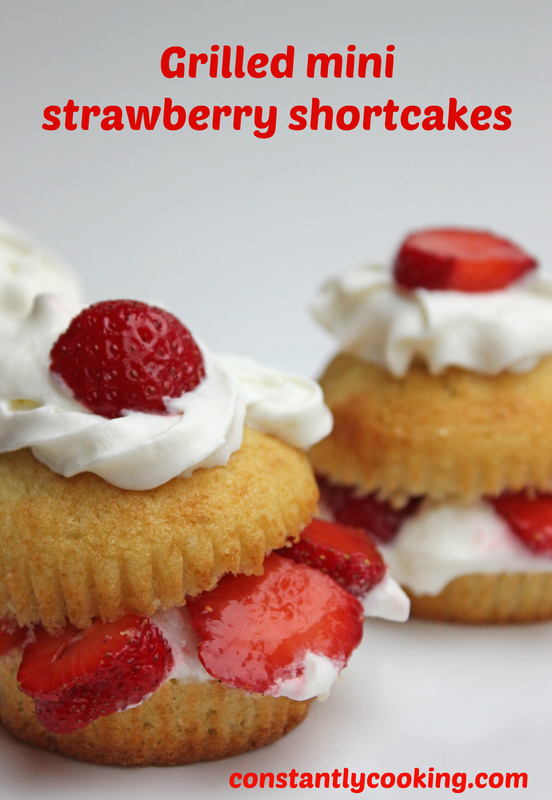 Make the shortcakes by preheating oven to 350F. Line 12 muffin tin compartments with paper liners and set aside. In a small bowl, combine flour and baking powder. Set aside. In a large bowl, beat the eggs and sugar for one minute. Add the vanilla and melted butter and beat until well combined. Add half the flour mixture to the egg mixture and beat until just combined. Add the milk, and beat until just combined. Add the remaining flour and beat until evenly blended. Divide the batter evenly among the muffin cups (fill each about 2/3 full). Bake for 15 – 17 minutes, until a toothpick inserted into the center of a cupcake comes out clean. While cupcakes are baking, rinse berries and place on a paper towel to dry. Hull and slice berries into a bowl. Sprinkle with sugar and stir gently; set aside. In another bowl, beat whipping cream until peaks form. Cover and refrigerate until needed. Remove cupcakes from the pan and let cool on a wire rack. When ready to assemble, preheat barbeque / grill to medium-hot (350F) (or use a heavy duty pan on the stove). Slice the cupcakes in half horizontally and lightly butter the cut sides. Grill the cupcakes, cut sides down, for 3 – 4 minutes until light grill marks appear. Put the bottom sections of the grilled cupcakes on a serving platter, grilled sides up. Top with whipped cream and sliced strawberries. Place the tops on, grilled sides down, then add more whipped cream and berries. Welcome to my kitchen! I play with words and with food. I love simple dishes prepared with passion and am always seeking to find new methods to make food as fun and flavourful as possible. I'm also an enthusiastic explorer of faraway lands and cuisines. This entry was posted in baking, Dessert and tagged best ever vanilla cupcakes, Canada Day, Canada Day dessert, cupcakes, dessert, fruit, party, Paula Roy, shortcakes, small batch cupcakes, strawberries, summer, what to make with strawberries, whipped cream, whipping cream. Bookmark the permalink.